Two Webby Awards for SleepBetter.org Video "2 Guys 600 Pillows"
The Webby Awards, the Internet’s most respected symbol of success, awarded both a Webby AND a People’s Voice award to Carpenter Co. and sleep tips website SleepBetter.org for the video 2 Guys, 600 Pillows. 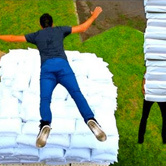 The effort was a commissioned work by “Internetainers” Rhett & Link, who put 600 pillows to work in a music video about what happens to our pillows when we hold onto them a little too long. The combined YouTube views of the actual video, the “making of” video, bonus footage and other associated videos is more than five million since the launch in September 2010. Earlier this year Time.com ranked the project as one of its Top 10 of Everything for 2010. Time Magazine describes the Webby awards as “the online OSCARS,” and this year’s winners include brands like YouTube, ESPN, The New York Time, Google, Yahoo! Inc, Dow Jones & Company, CNN, AOL, Conan O’Brien, Funny or Die and Dell. The awards are judged by the International Academy of Digital Arts and Sciences. The People’s Voice awards are selected by members of the public voting online. The video can be viewed at this YouTube link or by searching for “Rhett & Link” in YouTube and clicking on “2 Guys and 600 Pillows.” The VLOG (videolog) at the end of the video directs viewers to www.SleepBetter.org to see the “making of” video which to-date has registered more than 150,000 inbound clicks. The 2011 Webby Awards will be presented on June 13, and can be viewed live online. What's More Important – Your Phone or Your Sleep?